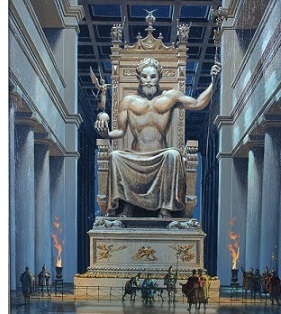 Statue of Zeus - One of the Seven Ancient Wonders of the World and the only one on the Greek Peninsula. It was built by the famous sculptor, Phidias, and completed in 456 B.C.. The statue stood 43 feet (13m) in height and was made of Chryselephantine, a combination of ivory and gold. Depicted sitting on his throne, the statue was housed in an almost equally impressive temple in the city of Olympia. It stood for nearly a thousand years before it was destroyed in a fire in the city of Constantinople where it had been moved after the temple was sacked in 475 A.D..